Many scientists believe that the key to predicting the future of climate requires understanding its past. Looking at historic temperature records and atmospheric composition can reveal patterns and natural cycles in Earth's climate that help scientists make predictions about what Earth's climate might be like in the future and how human behaviors such as burning fossil fuels contribute to climate change. In the first part of this Lab, you will learn about the processes and timescales involved in glaciation. 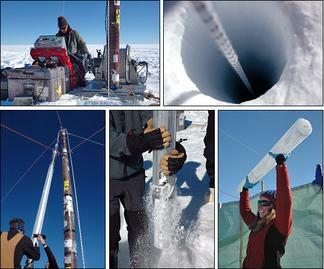 In Part B, you will learn about how scientists use ice cores to study climate history. In Part C, you will use an online interactive to explore how Earth's temperature, glacial ice, coastlines, and sea level have changed over the last 450,000 years. describe impacts of climate change on land ice and the oceans.